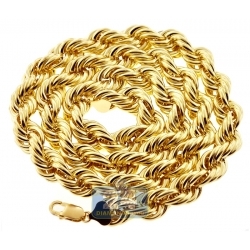 Gold rope chain is a timeless piece of jewelry that became very popular in early 80's when a lot of hip-hop celebrities wore them in the music clips and album covers. 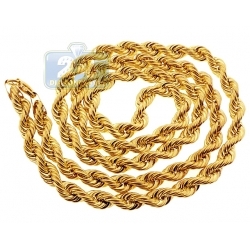 These men's rope necklaces consist of two and more thick strands woven together making a rope. 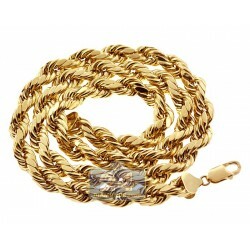 The rope chain style is a perfect choice for both men and women. One of the most fashionable ways to wear rope chains is to have several pieces of different lengths at the same time. It gives an interesting, well-balanced look. Another variant is to match a twisted chain with a lovely pendant for a unique statement. 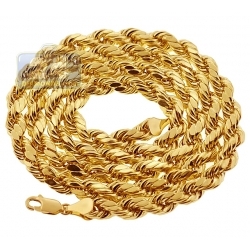 24diamonds.com carries a huge inventory of different gold rope chain sizes that are available in Italian 10k or 14k gold of yellow, rose and white colors as well as affordable 925 sterling silver. If you already own a plain rope, we offer one of a kind chains encrusted with top quality diamonds to make the absolute furor and impress everyone. 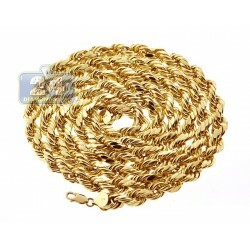 These gold rope necklaces give a gorgeous touch for both everyday wear and formal situations!